Thursday 31st May 2018 – 4.40pm – Murray MacGregor. Ambulance staff were put on standby after a man dredged up an unexploded grenade from a canal. The incident happened in a canal off Lathe Way, near Kingsbury Road in Castle Vale at just before noon. Two paramedic officers and the Hazardous Area Response Team were initially sent to the scene. A West Midlands Ambulance Service spokesman said: “A cordon was put in place until the EOD team came and assessed the item. After an initial assessment, the HART team were stood down. “The EOD team decided the safest option was to blow the grenade up and it was transferred to Pype Hayes Park in Erdington where it was destroyed in a controlled explosion. Wednesday 30th May 2018 – 11.30am – Jamie Arrowsmith. The best efforts of ambulance and hospital staff were sadly not enough to save a teenage boy who died following an incident in Wolverhampton last night. West Midlands Ambulance Service was called to reports of a stabbing on Strathfield Walk at 11.08pm and sent two ambulances, a paramedic officer and a rapid response paramedic to the scene. 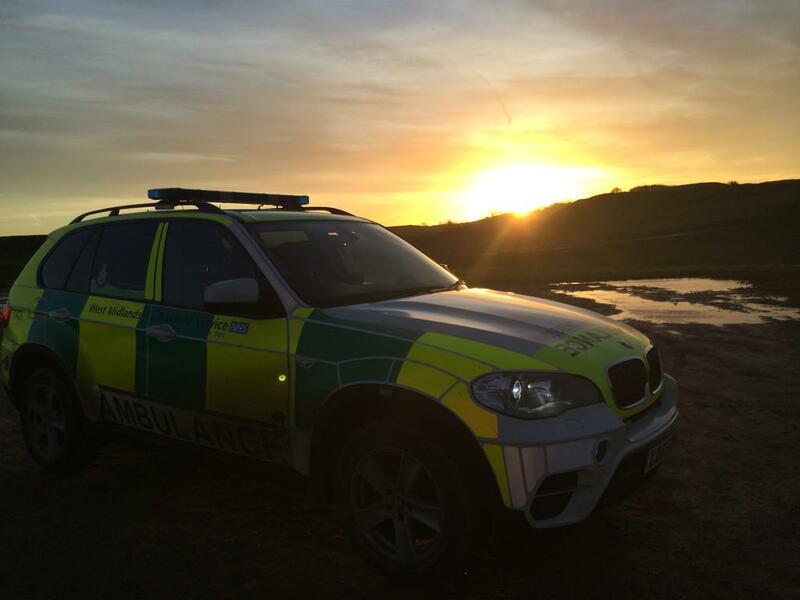 The first ambulance arrived in less than three minutes from when the 999 call was made. A West Midlands Ambulance Service spokesman said: “Crews arrived to find a 15-year-old boy with serious injuries. The team of ambulance staff worked quickly to begin administering advanced life support to him at the scene and this continued as he was transferred to New Cross Hospital. West Midlands Police are appealing for anyone with information about this incident to call 101; quoting log number 3060 of 29/5/18. Monday 28th May 2018 – 11:00am – Murray MacGregor. 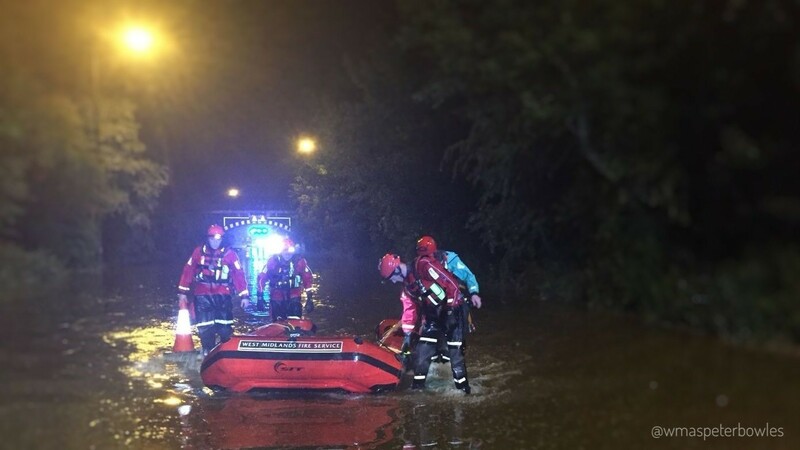 One man has died after a car was submerged in flood water. The incident happened in Lichfield Road in the Rushall area of Walsall at about 2.20am this morning (Monday). A West Midlands Ambulance Service spokesman said: “On arrival, ambulance staff found a flooded road with two vehicles in the water. “Firefighters who had entered the water had found an elderly man at the vehicle and taken him to an ambulance crew who were at the water’s edge. The ambulance crew carried out advanced life support before taking the man to Walsall Manor Hospital, but sadly he was pronounced dead shortly after arrival. “In total, four HART paramedics entered the water and worked with West Midlands Fire Service Technical Rescue staff. “A second person was found in the water but was unhurt. It is not believed that this person was from one of the vehicles. The second vehicle is believed to have been in situ for some time. Thursday 24th May 2018 – 4.30pm – Jamie Arrowsmith. 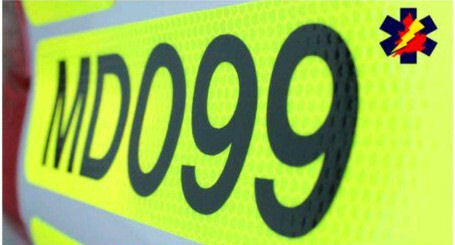 A man has died after falling from his motorbike this afternoon. West Midlands Ambulance Service was called to reports of a motorcyclist who had been in collision with street furniture on the A518 between Uttoxeter and Stafford shortly before 1pm. Two ambulances, a paramedic officer and the Midlands Air Ambulance from Staffordshire were to the scene. A West Midlands Ambulance Service spokesman said: “On arrival, crews discovered the man in cardiac arrest. Ambulance staff immediately began CPR and also administered advanced life support. A motorcyclist has died following a road traffic collision with a car yesterday afternoon (Wednesday). West Midlands Ambulance Service was called to Whitehall Road in Hampton Bishop, Hereford at 4.15pm and sent two ambulances, a paramedic officer and the Midlands Air Ambulance from Strensham, with a doctor on board, to the scene. A West Midlands Ambulance Service spokesman said: “On arrival, crews discovered a woman in cardiac arrest. An off-duty nurse and an off-duty firefighter had stopped at the scene and were performing excellent CPR. “Ambulance staff took over and also administered advanced life support but unfortunately it became apparent nothing could be done to save her and she was confirmed dead at the scene. Friday 18th May 2018 – 11.00am – Murray MacGregor. A workman who injured his ankles has had a most unusual journey to hospital … in a fire service aerial ladder platform. 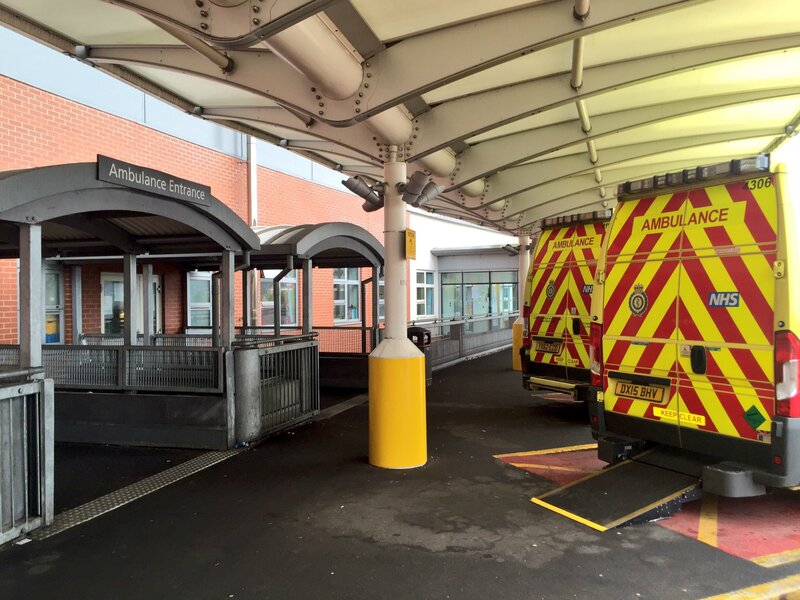 West Midlands Ambulance Service was called to Royal Shrewsbury Hospital at about 10.45am on Thursday morning to reports of a man who had fallen on a roof. A West Midlands Ambulance Service spokesman said: “On arrival it became apparent that the workman, who was in his 30’s, had not fallen per se. He told ambulance staff that as he stepped off a ladder onto a plank on the roof, his foot slipped off to the side. As he tried to regain balance he put his other foot down on the plank which also slipped off the side leaving him with two twisted ankles. “Ambulance staff requested assistance and Shropshire Fire Service who sent fire engines and the aerial ladder platform. “While they arrived, ambulance staff splinted the man’s left ankle and provided pain relief. “The ALP was then used to access the site from the opposite side of the building. The man was then helped onto the platform and lowered to the waiting Ambulance which took the man literally around the corner to A&E. Thursday 17th May 2018 – 5.30pm – Claire Brown. Despite the tremendous efforts of ambulance staff, a teenage boy has sadly died in Sutton Coldfield this afternoon. West Midlands Ambulance Service was called to reports of a stabbing in Lower Parade, Sutton Coldfield at around 3.30pm (Thursday). An ambulance, a paramedic officer, the West Midlands Central Accident Resuscitation Emergency (CARE) team medics and the Midlands Air Ambulance from Tatenhill airbase were responded to the scene. A West Midlands Ambulance Service spokeswoman said: “Crews arrived to find a 16-year-old boy with serious injuries. The team of ambulance staff worked quickly to begin administering advanced life support to the boy at the scene. Sadly, nothing could be done to save the boy and he was confirmed dead a short time later. Monday 14th May 2018 – 5.45pm – Murray MacGregor. A woman has been airlifted to a major trauma centre while three other patients have been taken to hospital after a two-car crash. The incident happened at about 4.00pm on Sunday near Jones Coaches, on the A465 at Ocle Pychard in Herefordshire. Three ambulances, a paramedic officer, two BASICS Emergency doctors from the MARS scheme and the Midlands Air Ambulance from Cosford were sent to the scene. A West Midlands Ambulance Service spokesman said: “When crews arrived, they found two cars that both had extensive front end damage. One car, a BMW was against a hedge. “There were two people in each car. The most seriously injured patient was the woman driving the BMW. The woman in her 30s had possible internal injuries. She was given pain relief, was immobilised before being airlifted to the major trauma centre at the Queen Elizabeth Hospital Birmingham. “A baby boy from the car was uninjured but was taken to Hereford County Hospital by ambulance as a precaution. Monday 14th May 2018 – 3.15pm – Murray MacGregor. A woman has died and two men have suffered serious injuries after a three car collision. It happened at about 7.40pm on Sunday evening on the A49 Ludlow Road, between Leominster and Stockton. Three ambulances, a paramedic officer, two BASICS Emergency Doctors from the MARS scheme and the Midlands Air Ambulance from Strensham were sent to the scene. A West Midlands Ambulance Service spokesman said: “On arrival, ambulance staff found three cars a BMW, a Skoda and a Peugeot that had been involved in a collision. “Tragically, a woman in the Skoda was confirmed deceased at the scene of the crash. “There were two men in the BMW, both who were severely trapped. Ambulance staff and the doctors worked with firefighters to free the men, who were both believed to be in their 20s. “It took over an hour to free the first man. He had suffered multiple fractures. He was immobilised had splints fitted and was then taken to the major trauma centre at Queen Elizabeth Hospital Birmingham with one of the doctors travelling with the ambulance crew. “The second man was trapped for around 50 minutes. He had suffered multiple injuries. After being immobilised and given pain relief, he was airlifted to the major trauma centre at University Hospital Coventry and Warwickshire. We can’t quite believe it, but we just won a BAFTA! It was one of those moments in life where you think you might have a chance, but you can’t really believe that you will…and then it happened; we won a BAFTA! Thursday 10th May 2018 – 5.30pm – Jamie Arrowsmith. A woman has been airlifted and taken to one of the region’s major trauma centres after falling whilst walking on the Malvern Hills this afternoon. The incident, just after 12.05pm, happened near to Chase End in Bromsberrow, on the edge of the Malvern Hills. One ambulance, a paramedic officer and the Midlands Air Ambulance from Strensham attended the scene. A West Midlands Ambulance Service spokesman said: “The patient, a woman in her 60s, had come to rest on a flat area of ground following a fall down a steep embankment, in which it is believed she hit a branch. 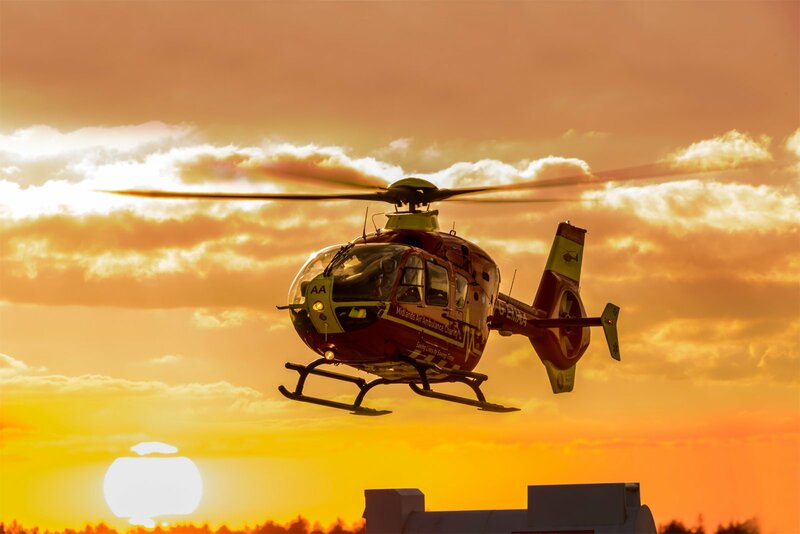 “The Air Ambulance was the first resource on scene, followed by the crew and officer, who made their way on foot from the nearest road access, approximately three-quarters of a mile away. “Transporting the woman back to the land ambulance would have been an almost impossible task due to the distance and the terrain, so the decision was made to carry her back to the top of the hill where the air ambulance had landed. “Following treatment for abdominal and shoulder injuries, the patient was immobilised with the use of a scoop stretcher and given pain relief. Thursday 3rd May 2018 – 5.00pm – Murray MacGregor. A motorcyclist has been taken to a major trauma centre after coming off his bike on a dual carriageway and colliding with a lamppost. The incident happened on the Wolverhampton Ring Road, just beside the Molineux football ground. An ambulance and a non-emergency ambulance both came across the incident four minutes after the initial call at 1.20pm. A paramedic officer and the Midlands Air Ambulance from Cosford, with a trauma doctor and critical care paramedic on board, were also sent to the scene. A West Midlands Ambulance Service spokesman said: “On arrival, the rider was found some distance from his motorcycle with his helmet off. Thursday 3rd May 2018 – 11.49am – Murray MacGregor. A motorcyclist has died after a crash with a car. It happened around 8.40pm on Wednesday night in Stoke on Trent, on the slip road off the southbound A500 leading to City Road where Glebe Street passes overhead, . An ambulance, a paramedic officer and a BASICS Emergency Doctor from the North Staffs scheme attended the scene. A West Midlands Ambulance Service spokesman said: “On arrival, ambulance staff found a man who had suffered very serious injuries. Sadly, it quickly became apparent that there was nothing that could be done to save him and he was confirmed dead at the scene. Thursday 3rd May 2018 – 9.49am – Murray MacGregor. Two cyclists have been injured, one seriously, after they were involved in a collision with a car. 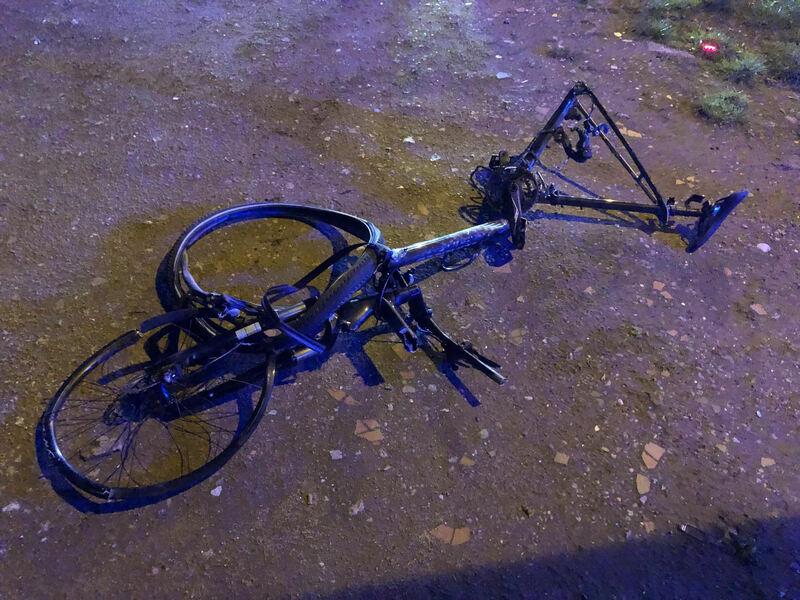 The incident, which happened at around 8.45pm on Wednesday evening, happened outside New Cross Hospital in Wolverhampton and left the two bicycles completely destroyed and the car on its side on the pavement. An ambulance was on scene in six minutes and was backed up by a second ambulance, a paramedic officer and the MERIT trauma doctor and critical care paramedic. A West Midlands Ambulance Service spokesman said: “On arrival the man and woman cyclists were found some distance from their bikes. “The woman, who was in her 40s, had suffered suspected fractures to an arm and a leg. Both were splinted before she was taken on blue lights to the major trauma centre at Queen Elizabeth Hospital Birmingham. “The man, who was in his 50s had multiple lacerations and bruising to his legs. He travelled with the woman to hospital. Wednesday 2nd May 2018 – 12.45pm – Murray MacGregor. A man was trapped for well over an hour after a crash on a busy dual carriageway this morning. The crash happened on the A45 Fletchampstead Highway, close to the railway line, in the Canley area of Coventry at just before 9.30am this morning. An ambulance arrived on scene in just four minutes and was backed up by a paramedic officer and the aircrew of the Warwickshire and Northamptonshire Air Ambulance, who responded in a car. A West Midlands Ambulance Service spokesman said: “When ambulance staff arrived they found a car that had collided with a pole and had ended up on the crash barrier at the side of the road at an angle. “Due to the way the vehicle ended up, it was a difficult job to free the man from the vehicle safely. Ambulance staff worked closely with firefighters to extricate the man, who had suffered potentially serious trauma injuries. In total it took about 80 minutes to get him out. Wednesday 2nd May 2018 – 10.45am – Murray MacGregor. Three young men have been hurt, two potentially seriously after a single vehicle rollover RTC. It happened on Gayhill Lane in the Kings Norton area of south Birmingham at just after midnight. The first ambulance arrived seven minutes after a 999 call from a member of the public who had come across the crash. A second ambulance, a paramedic officer and the MERIT trauma doctor and critical care paramedic were also sent to the scene. “A man of around 20 years was found in a field nearby. While ambulance staff assessed his condition, firefighters opened a gap in the hedge and fence so that he could be brought to the ambulance. 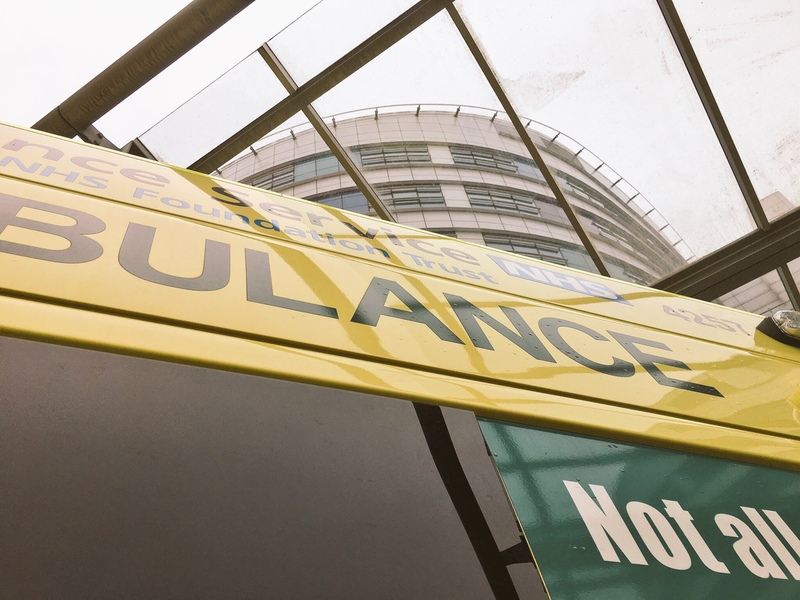 “The man was anaesthetised at the scene and immobilised before being taken on blue lights to the major trauma centre at Queen Elizabeth Hospital Birmingham with the doctor accompanying the crew. “An 18-year-old man was also taken on blue lights to the same hospital with multiple bruising and lacerations after he was found beside a bush next to the car. Tuesday 1st May 2018 – 8.40am – Jamie Arrowsmith. 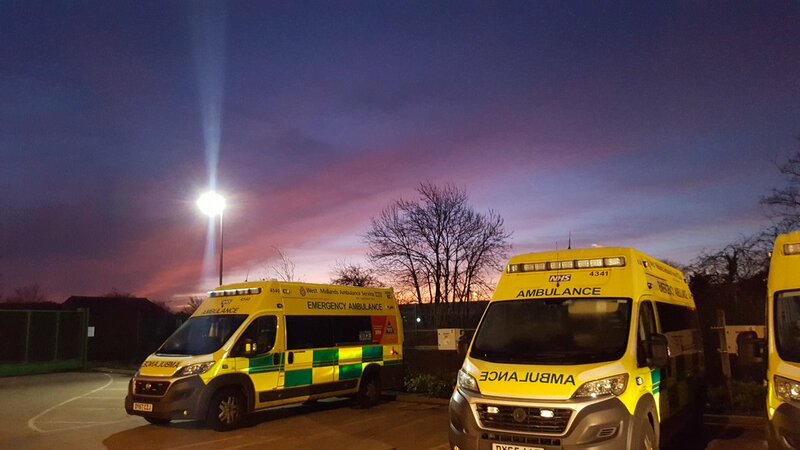 A pedestrian has been taken to one of the region’s major trauma centres following a collision with a car last night (Monday). West Midlands Ambulance Service was called to Wolverhampton Road, Oldbury, near to the Ramada Hotel, at 10.56pm and sent one ambulance and a rapid response paramedic to the scene. An off-duty student paramedic also stopped at the scene to help. A West Midlands Ambulance Service spokesman said: “Crews arrived to find a man, believed to be in his 50s, who had been injured in collision with a car. “He was treated for serious leg injuries as well as minor injuries to his head and chest.